This is a stylized diagram of a fun project I've been working on recently (even got a cardboard prototype made). A friend asked "How would the wrist blade from Assassin's Creed actually work?" and this question bugged me until I sat down and started designing. 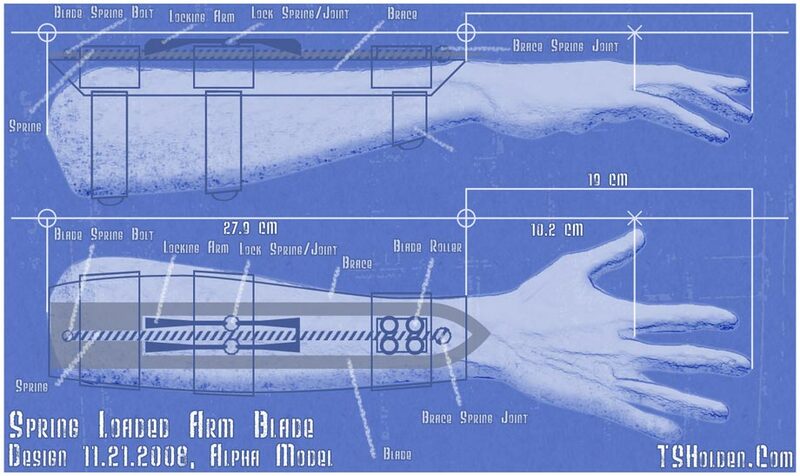 The design quickly changed from a single-purpose wrist knife to a more broadly applicable forearm blade. In a nutshell, the middle of the blade itself is cut out to allow room for rollers and a central spring. The stretched-out spring contracts when the locking arms are pulled upwards, whipping the blade out, where it is locked into place by the auxiliary locking arms (which have to be manually unset by a second hand). Not shown in this image are the cords that run from fore- and picky-fingers to the locking arm. I couldn't think of an elegant way to represent them without obscuring the rest of the design. Image made in Photoshop CS3, using two webcam photos of my own arm (yes, I have unusually long hands, even longer than they appear here... the masking makes my fingers look fat). Special thanks to Obsidian Dawn for a handful of Photoshop brushes used in this.